As further proof that I buy too many multipacks, I found myself somewhat unintentionally in possession of a number of versions of a MB generic casting, the Sahara Survivor. 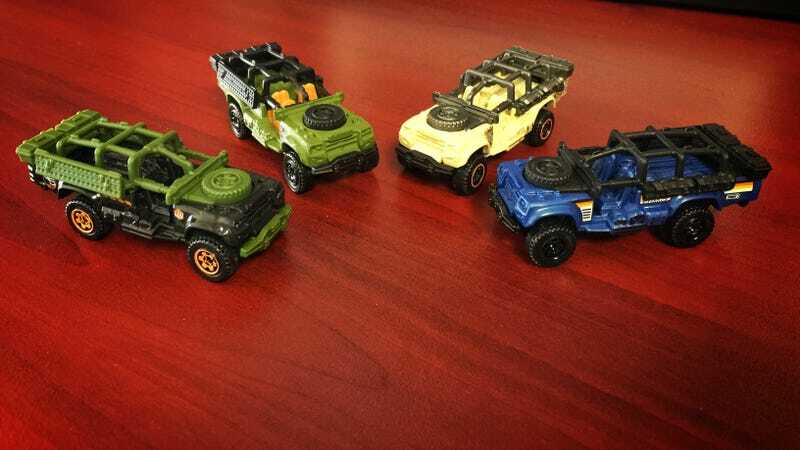 It’s clearly modeled after a Land Rover-esque off road expedition vehicle, but once I took a closer look at them I found myself really liking it and adding the 4 I had into my collection and not passing them off to my friends kids. Its also an example of MBs recent cost cutting measures, as I’ll show below. Originally, this was a metal body casting, with a plastic base, which is now reversed…and they changed the configuration of the interior pieces and combined it with part of the hood. The green one is the earlier version, has a separate color interior piece, and is noticeably heavier. I like some of the details of this casting, especially the bent wheel in the rear. They did keep that detail when they changed from the metal body version.